Our winter newsletter is now available, bringing together the latest news and views from EQ Investors. It’s hard to get away from all the speculation about Brexit at present but while this is a very significant issue for UK residents, it’s not so important for us as global investors and citizens. In fact, most of the world population have never heard of Brexit and really couldn’t care what happens. Many more will have witnessed the impact of climate change, environmental destruction and other adverse events arising from capitalism being practised without conscience. In my opinion, when we look back in ten years’ time these will be the ongoing themes that still interest people. Impact investing is still a relatively new concept. Many people will be thinking that seeking impact inevitably results in lower returns but this is not necessarily the case. Our 2018 Impact Report showed that impact companies have grown revenues and profit significantly over the last 5 years and much more than FTSE 100 companies. This is no surprise to us as impact companies are usually innovative by nature and are taking advantage of fast-growing markets such as energy efficiency, healthcare or education. So there should be a positive overall impact on financial returns from taking this approach. The area in which there is potential for a negative impact on performance is by excluding or minimising investment in certain sectors, such as armaments & tobacco and fossil fuels, which have periods in which they deliver above average returns. We believe that the net effect should still result in outperformance but we can’t be certain about that. All EQ clients have some exposure to impact investing because many mainstream fund managers now take these factors into account when selecting stocks for their funds. 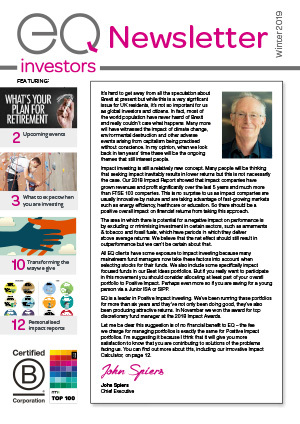 We also include some specifically impact focused funds in our Best Ideas portfolios. But if you really want to participate in this movement you should consider allocating at least part of your overall portfolio to Positive Impact. Perhaps even more so if you are saving for a young person via a Junior ISA or SIPP. 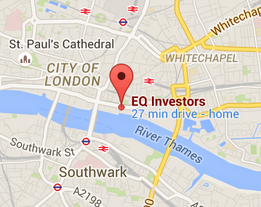 EQ is a leader in Positive Impact investing. We’ve been running these portfolios for more than six years and they’ve not only been doing good, they’ve also been producing attractive returns. In November we won the award for top discretionary fund manager at the 2018 Impact Awards. Let me be clear this suggestion is of no financial benefit to EQ – the fee we charge for managing portfolios is exactly the same for Positive Impact portfolios. I’m suggesting it because I think that it will give you more satisfaction to know that you are contributing to solutions of the problems facing us. You can find out more about this, including our innovative Impact Calculator, on page 12. John is the CEO of EQ. After gaining an MA in Engineering at Clare College, Cambridge he went into the City as a research analyst for 10 years. In 1986 he set up Bestinvest and over the next 20 years it grew to become a leading private client advisory and wealth management business with over 50,000 clients. In 2007 Bestinvest was acquired by 3i. Since then John has built up a portfolio of other interests, including the establishment of a Foundation to support various charities. He has taken a particular interest in projects aimed to increase the use of Early Intervention to reduce child abuse. He has also retained a close interest in investment, being a Fellow of the Chartered Institute for Securities and Investment and a member of the Investment Committee for Clare College. John enjoys competitive sport and participates in historic motorsport and international croquet.